The 10/11 JO boys winners pose with their ribbons and medals following Thursday’s competition. A number of young Cherry Hill divers came away with first place medals at the South Jersey 1-meter Diving Championships at Erlton Swim Club on Thursday, July 20. 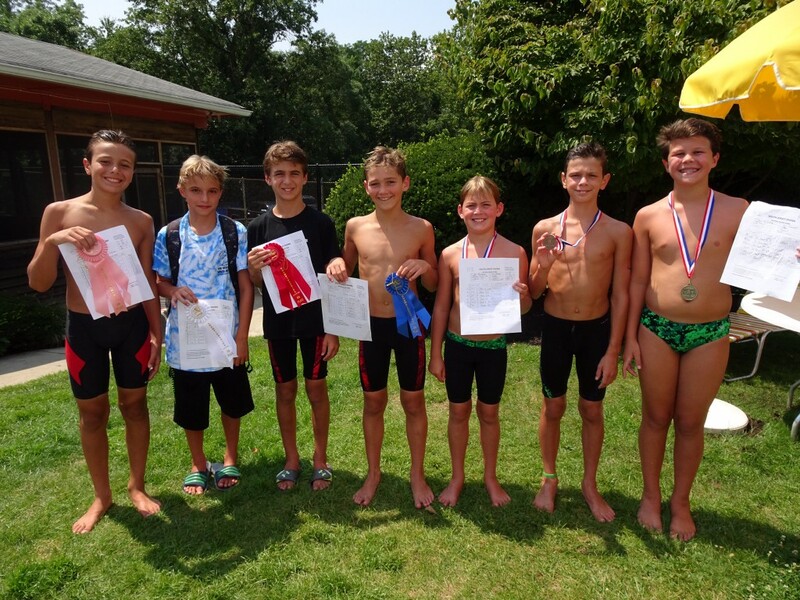 Seven divers from Cherry Hill swim clubs took first place in their respective division at the meet. The competition featured divers up to age 18 who had met the minimum qualifying score in a series of meets earlier this summer. Nolan Perry of Downs Farm led off the day by taking first place in 9U Junior Olympiad boys division with a score of 150.40. Later in the morning, Erlton divers Evan Bailey and Charlie Webb joined Perry as first place winners. Bailey won the 10/11 novice boys competition, while Webb took first place in 10/11 JO boys competition. Christian Termine dives toward the pool during his second attempt of the competition. Ryan Boone, Christian Termine and Dillon Hall were first place finishers during the meet’s early afternoon session. Boone won the 14/15 novice boys division with a score of 183.30. Termine’s score of 173.70 was good enough to win the 16–18 novice boys division. Hall recorded the top score across every division for the afternoon, registering a 486.60 to win the 16–18 JO boys competition. Hall’s performance included five 10s from the judges on one of his dives. 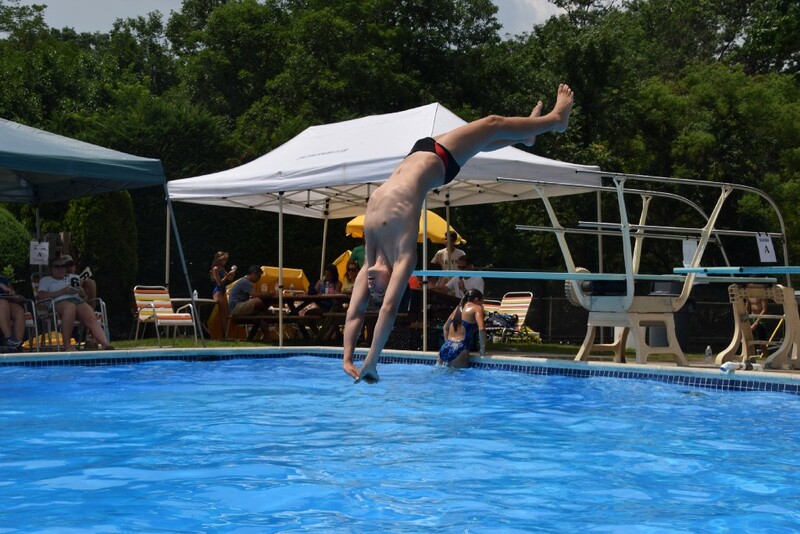 Covered Bridge Swim Club’s Dillon Hall completes his second dive of the competition. In the late afternoon session, Aiden Rorke of Woodcrest was victorious in 12/13 JO boys division with a score of 229.80. Downs Farm was the top finishing team from Cherry Hill in the meet. The Dolphins’ registered 27 points to finish in sixth place. Haddon Glen Swim Club of Haddon Twp. won first place in the team competition, edging Wedgewood Swim Club of Haddonfield by just one point, 67–66. SJDA Senior Scholarship winners Elese Bevelheimer, Zach Casey and Sophia Peifer. The afternoon wasn’t just about diving. 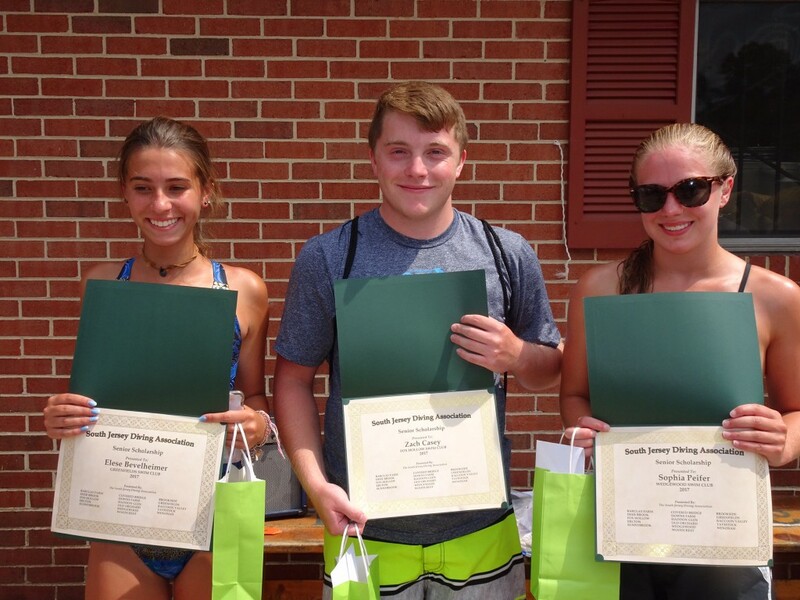 The South Jersey Diving Association gave $500 scholarships to three seniors who submitted essays. The divers has to explain how diving helped prepare them for their future and what was the most important thing they learned from diving. The three winners were Elese Bevelheimer of Green-Fields Swim Club, Zach Casey of Fox Hollow Swim Club, and Sophia Peifer of Wedgewood Swim Club.